"The whole world… is under attack!" 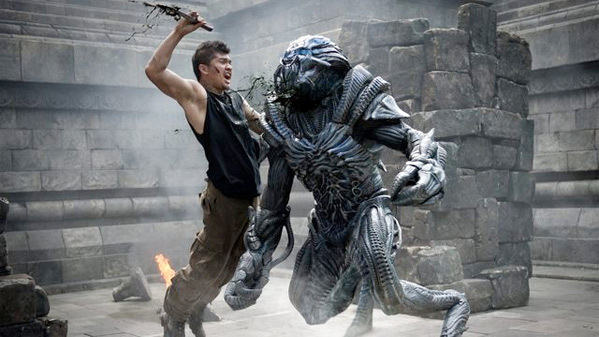 Vertical Entertainment has unveiled an official US trailer for the sci-fi spin-off sequel Beyond Skyline, which is indeed a sort-of sequel to the sci-fi disaster Skyline from a few years back. And from the looks of it, this one is going to be just as much of a disaster. The directors of the original film have produced this, though they've let Liam O'Donnell direct this time. Beyond Skyline tells the story of a detective who goes into one of the alien spaceships to rescue his son. Frank Grillo stars, with Bojana Novakovic, Iko Uwais, Callan Mulvey, Valentine Payen, Betty Gabriel, Jack Chausse, and Kevin O'Donnell. I've heard this film is a big mess, but still has some badass action in it. Take a look. You can still watch the first international trailer for Beyond Skyline here, to see even more footage. A tough-as-nails local detective (Frank Grillo) embarks on a relentless pursuit to free his son from a nightmarish alien warship. Beyond Skyline is directed by new American filmmaker Liam O'Donnell, a producer/screenwriter (who co-wrote the original Skyline) and visual effects consultant for Hydraulx, now making his feature directorial debut. The screenplay is also written by Liam O'Donnell. This one is produced by Colin Strause and Greg Strause, co-directors of the original Skyline, with Hydraulx involved with the effects again. The film opens first in Russia, then will hit theaters in the US starting December 15th this fall. It premiered first at the Sitges Film Festival this month. Does anyone really want to see this? Who's in?